SGLC is an extension of LOLC. 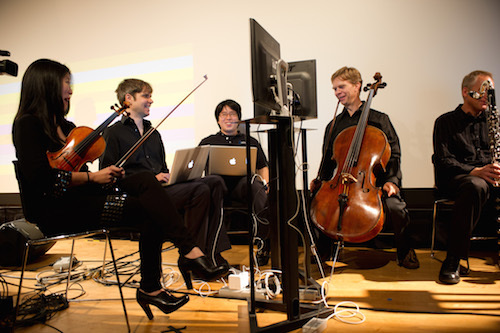 In this extended environment, laptop musicians generated real-time music notation on the fly by typing commands in the environment and instrumental musicians sight-read the generated score for collaborative improvisation. Here the outcome of text-based interaction is real-time notation, not music. The generated music score is rendered in various forms so that it gives space for instrument performers to interpret (e.g., open-form score, such as graphical or textual score). The user study showed that the system effectively integrates acoustic instrument players into a mixed ensemble. We believe the idea of mediation can be easily transformed to a collaborative livecoding scenario. The outcome of live coding need not be generative music; it can be a medium to instrumental musicians. Real-time Music Notation in Mixed Laptop-Acoustic Ensembles (link). Real-Time Music Notation, Collaborative Improvisation, and Laptop Ensembles (paper). Sang Won Lee, Jason Freeman, Andrew Collela.